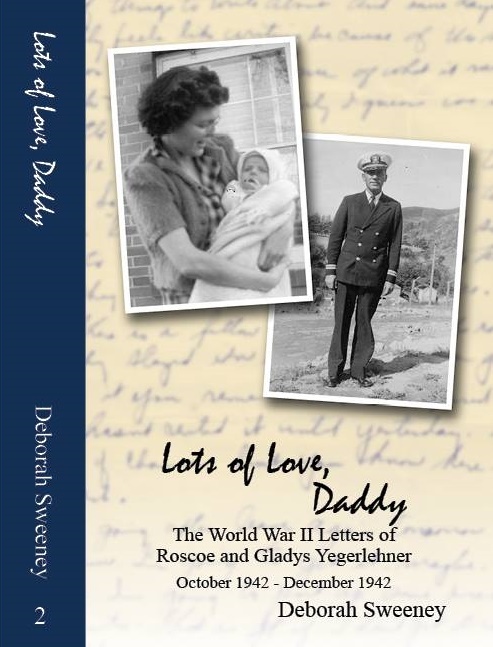 Meanwhile, the Yegerlehner family was reunited in Liberty, Missouri, where Roscoe would be stationed for the next 14 months at the William Jewell College Naval Flight Preparatory School. Since David’s last month he has traveled by train from Chicago to Kansas City, Mo. – (506 miles). David has two more teeth (upper bicuspids). Now comes in and says “tie-tie” when he wants to toidey. Gets anyone’s shoes he can find and walks around (clomp, clomp). He likes the story of the Three Billy Goats Gruff. Knows the pictures in the book and points out the different objects. David and Mark have a double deck (Navy) bed. Mark sleeps on the upper and David lower. He can climb up on his bed anytime he wants to. 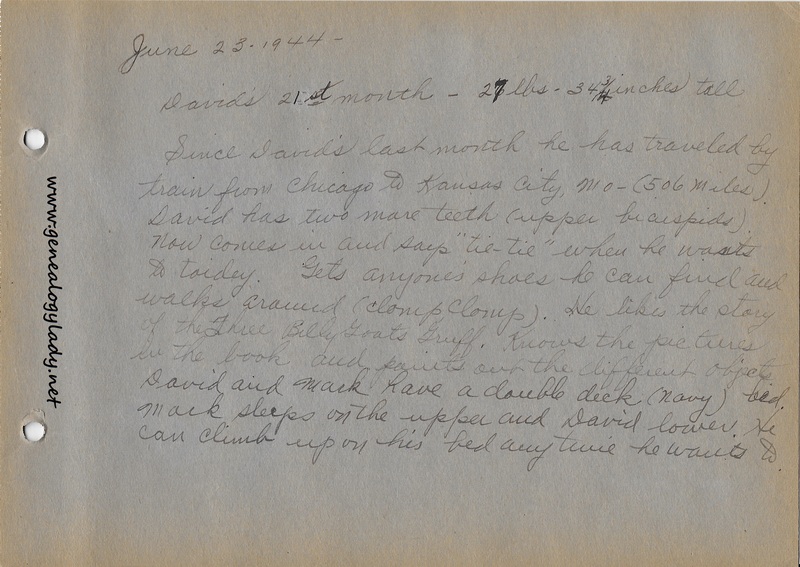 This entry was posted in Foster, Genealogy, World War II, World War II Letters, Yegerlehner and tagged David A. Yegerlehner, genealogy, Gladys R. (Foster) Yegerlehner, Liberty, Mark A. Yegerlehner, Missouri, Naval Flight Preparatory School, Roscoe S. Yegerlehner, United States Naval Reserve, William Jewell College, World War II, World War II letters on March 7, 2016 by Deborah Sweeney. “He likes the story of the Three Billy Goats Gruff.” I don’t remember the book, but I do remember the title. How many pages are there in the baby book? I.e., it brings me up to what age? The baby book is fairly good up to your second birthday then it skips quite a bit as there were only 2-3 pages left in the book at that point.